Amanda Coggins has over 28 years of experience in Sales and Marketing and has been an integral part of the success for every client she has worked with over the years. Her attention to customer service has earned her a reputation as a leader in the exhibit industry. First as Director of Sales Marketing, and now as a Vice President at CMS, she is responsible for the overall growth of the company in addition to ensuring customer satisfaction for each and every client. Her past experience includes working with such notable customers as The Smithsonian National Museum of Natural History, NOAA, The U.S. Army Center for Military History, The U.S.S. Monitor Center among others. For over two decades, Chuck has worked with a wide variety of designers and institutions to develop and produce successful exhibit projects. His 15 years as a cabinetmaker and architectural millworker, 21 years in museum exhibit fabrication and degrees in economics and business management combine to provide clients with experience and first-hand knowledge. In addition to his role in business development, Mr. Schwieder has also served as project manager for many prestigious clients. Ms. Lombard is a creator of imaginative, interactive experiences. She has an extensive background in developing brands, audiences, educational programs and products as well as writing, producing, designing and directing events, exhibits, web and film. As one of our newest members of the CMS museum team, Lola’s attributes bring a wealth of diversity, enabling CMS to continue providing our clients with exceptional service, skill and knowledge in every aspect of the museum exhibit industry. Mr. Gault has over 35 years of experience producing photographic and digital output for trade show and museum fabrication firms. Barney’s superb reputation for knowledgeable quality service can be traced to his decades of hands-on experience with every level and aspect of modern graphic production. has been an invaluable asset to our staff. Tim’s hands-on background and experience in woodworking enables him to have a clear and knowledgeable understanding of museum exhibit projects and their individuality and complexity. He is also adept at working with clients/designers on case layouts for graphic and artifacts using his knowledge of object mounting, lighting, shadows and viewing angles to provide insight into spatial relationships between all exhibit components. 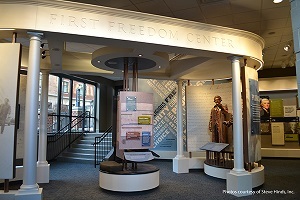 For over 27 years, Mr. Hemminger has been involved in the fabrication and installation of quality custom exhibits for museums, visitor centers, corporations and government agencies. Early on he was involved with the graphic design and art production side of commercial displays, eventually moving into museum and institutional work. For the past 17 years, Darren’s main focus has been the management of large museum exhibition projects, including many with significant numbers of original objects. Mr. Hemminger is proficient at coordinating and monitoring all work phases; establishing project milestones and tracking budgets and schedules; identifying and managing subcontractors and vendors; and, maintaining communications as a single point of contact for clients and project personnel. Mr. Watson’s knowledge of architecture and experience in the building industry has given him a strong base, one on which he has developed and expanded his talents to include cabinetmaking, fine woodworking and finishing, and artifact mount making. His work is evidence of the knowledge and craftsmanship needed to produce a high quality end product. Mr. Watson manages and supervises the fabrication of all CMS projects. Brian’s cabinetmaking skills have been utilized in exhibits such as: “DRAW! Political Cartoons” for the National Archives (NARA); the “Albert Gallatin House” at Friendship Hill, PA, for the U.S. Army Center of Military History (USACMH); and, “Before Freedom Came” for the Museum of the Confederacy, Richmond, VA.
Chet has over 30 years of experience in audio-visual integration and systems design for museums, visitor centers, welcome centers and corporate offices across the United States. He has worked hands-on with project managers, designers, clients and contractors in every aspect of AV integration and is fluent in PC, MAC, monitors, touch-screen, projectors, lighting and sound.